• Free lead testing for residential drinking water available for a limited time. Click here for details. It’s the law in New York State! Your child’s doctor must test for lead during the Well Child exam. Ask for a lead test when your child is one year old and again at two years old. A new coat of paint may cover up the danger. But chipping and crumbling plaster walls can expose the old lead paint and the danger returns. Paint chips that break off walls. Dust from cracking paint or plaster that settles on toys, food or bedding. Hot Water from old lead pipes. If your child has lead in his or her blood, new and growing cells and tissues continue to be damaged. The more lead in your child's blood, the more damage it causes. How to protect children from lead poisoning. Keep your child away from sources of lead. find out if there is a dangerous amount of lead in your house or apartment. keep children away from peeling paint and broken plaster. wash your child's hands and face often to remove any lead dust or dirt. wash your child's toys often, especially teething toys. 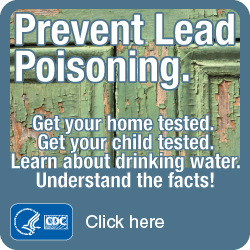 Keep your home or apartment free of lead. have the paint and plaster on your walls tested for lead before you renovate or remodel. Keep your community safe from lead poisoning. work to keep lead dust out of the environment. If you see uncontrolled grinding or sanding of exterior paint in your residential area, find out if the surfaces have been tested for lead. Or notify the Tompkins County Health Department at 274-6688. The blood lead test tells you how much lead is in your child's blood. Lead can harm a child's growth, behavior, and ability to learn. The lower the test result, the better. 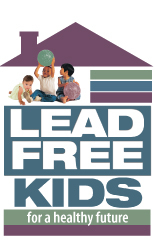 Most lead poisoning occurs when children lick, swallow, or breathe in dust from old lead paint. Most homes built before 1978 have old lead paint, often under newer paint. If paint peels, cracks, or is worn down, the chips and dust from the old lead paint can spread onto floors, windowsills and all around your home. Lead paint dust can then get onto children's hands and toys, and into their mouths. Most children have had some contact with lead in old paint, soil, plumbing, or another source. This is why New York State requires doctors to test all children with a blood lead test at age 1 year and again at age 2 years. For children up to age six years, your doctor or nurse should ask you at every well child visit about ways your child may have had contact with lead. Children who have had contact with lead should be tested. The average lead test result for young children is about 2 mcg/dL. Your doctor might want to test your child again in 3 to 6 months. Talk with your doctor or nurse about your child's diet, growth, and development, and possible sources of lead. Talk with your local health department about how to protect your child. They may visit your home to help you find sources of lead. Your child might have to stay in a hospital, especially if your home has lead. Your local health department will visit your home to help you find sources of lead. Your child should not go back home until the lead sources are removed or fixed. Your child needs to be tested again after treatment. Source: NYS Department of Health. Download a PDF from the NYSDOH website. Lead based paints were manufactured for residential use until 1978. Some lead based paints contained as much as 50 percent lead by dry weight. When was your house last painted? Remodeling Safety: Know before you work on your home. Whether you do it yourself or hire it out, before you remodel or renovate your older (pre-1979) home, learn the latest safe remodeling practices! Have painted surfaces tested before disturbing them. Call Environmental Health (EH) at 274-6688 about sampling and testing services. Interpret results correctly. Make sure you understand how lead content is described, what levels are acceptable, and who may be affected. Ask EH staff to assist you. Proceed responsibly. Tompkins County Sanitary Code considers lead paint dust an environmental hazard. Uncontrolled discharge of lead paint dust is a violation of the code and could result in substantial daily fines. The US-EPA requires contractors to be certified for lead paint removal. For more complete info about lead paint removal, click here. Who to call and how to find out more about lead. Call Community Health Services at the Health Department, (607) 274-6604. Call the Environmental Health Division of the Health Department, (607) 274-6688. Cornell Cooperative Extension of Tompkins County. These pages are designed to give you access to information on all aspects of the Federal lead poisoning prevention program, with a special focus on the efforts within EPA's Office of Pollution Prevention and Toxic's (OPPT). In the past, automotive sources were the major contributor of lead emissions to the atmosphere. Lead is a metal found in natural deposits as ores containing other elements.